SOUTH HOLLAND, IL – For over thirty years the Board of Trustees of SSC has recognized outstanding art students by purchasing artworks of excellence. The artwork becomes part of the permanent art collection of South Suburban College for use for in our college halls, offices, and galleries. To date there are over 200 student works proudly displayed around South Suburban College. The selection process involves a jury of art faculty members who nominate artwork from the Fall and Spring Biannual Juried Student Art Exhibit. All selections nominated by the jury are individually evaluated on their merit and as examples of excellence of outcomes the Art & Design faculty have determined to be objectives for the art courses of our college. 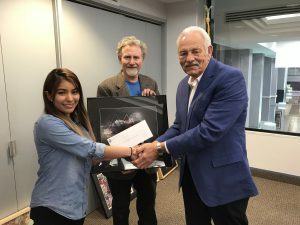 Finalists for the college’s art collection are selected at the end of the spring semester and are presented to the Board of Trustees at the May meeting. The public is welcome to visit our art galleries at no charge. The Dulgar Gallery is on the first floor. SSC Galleries are open at minimum Mondays through Thursdays from 9:00 a.m. – 6:00 p.m., and Fridays from 9:00 a.m. – 4:00 p.m. The galleries are closed on weekends and holidays. For more information, please call (708) 596-2000, ext. 2445 or ext. 2316, or visit www.ssc.edu/art. SSC is located at 15800 South State Street, South Holland, Illinois.